Another month, another Orchid Society Cartoon, and yes, there is a bit of colour! You can see the concept and drawing was pretty well sorted from the start (drawing 1). Drawing 2 (the little bit at the top left) shows some interesting things. The little tiny alien shows how I changed the design slightly by altering the proportions and trying to add a line of action through the body. I like how that little one turned out more than I like any of the other larger alien drawings. You can also see I was working on the design of the flying saucers, the panel layout with the "translation" panel across the bottom of the cartoon (not shown in these roughs, but is present in final) and the alien's language. Panel 3 is the rough for the final cartoon. I really like the flying saucers shooting at the buildings. When I did it, I was reminded of a time WAAAY long ago when I was drawing with another kid who was drawing a war scene. As he drew a tank shooting at a few soldiers, he made gunfire sound effects. Next time you draw something like that, try making sound effects. It might not improve the drawing but sure makes it more fun to draw! Pew, pew pew go the flying saucer laser bullets. And the last one (drawing 4) was initially done in grey tones, but got thinking about Mr. Illustrated Ghost's ongoing request for colour. I had an idea of how the colour should be, so just went for it. It's pretty good, but now that I look at it, I have a problem... what's the rectangle on the floor? Is it a carpet or light coming from the window? I meant it as light, but if so, why isn't that light being blocked by the aliens and then why are their shadows under them, not stretching to the bottom left with the light? Yes, I agree, let's say it is a carpet! It was during the inking that I made the alien's pupils rectangular which is kind of interesting. The dialogue (or translation) was difficult to make short but say everything that needed to be said, but lucky for me, Christine helped out. 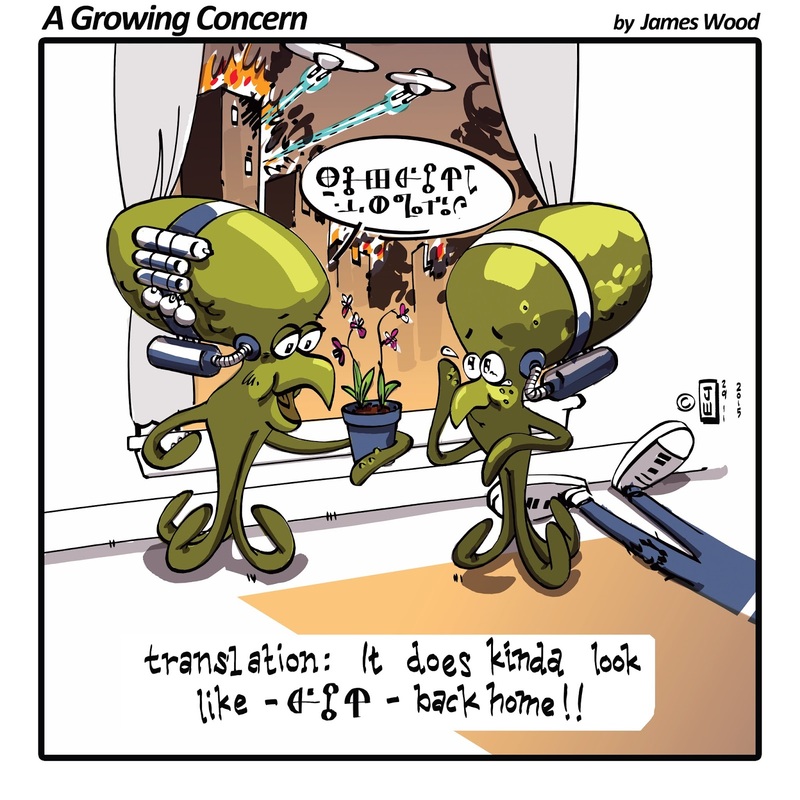 I like how a part of the alien's language is in the translation which suggests that word or phrase cannot be translated into anything meaningful to humans. And here's the final piece. The colour is beautiful! That's it -- you can't go back! You've gotta keep going in colour! I had to come back to add that the whole cartoon is great. The joke is pretty funny, the aliens are drawn really well and -- I just can't stop going on and on (and on!) about the colour! And I totally get that - while it isn't rational - the colour on the floor is just plain "right". Oh... and... also? I love the alien language. That probably took awhile to dream up! Regarding the language, I can't take credit. There was a guy in my grade at high school - Brian Moore - who created his own alphabet/language and it was comprised of circles and lines somewhat like what I did. Why tell you this (and open myself up to a lawsuit)? I do believe a lot of art is theft, and it progresses and changes and gets better and more interesting the more we work together, show our work and trade ideas (read: steal). Thanks, Brian. Mr. Illustrated Ghost loves your work!